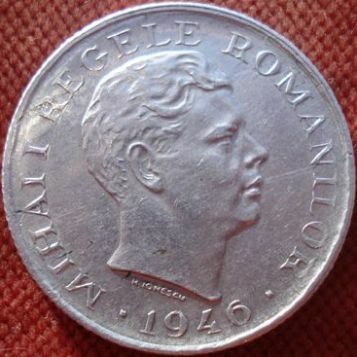 ROMANIA, denomination "500 LEI" and a laurel wreath inscription "MIHAI I REGELE ROMANILOR" meaning "KING OF THE ROMANIANS", MIHAI I head facing right and year ·1946·. Under the neck lies H. IONESCU, the engraver's name. 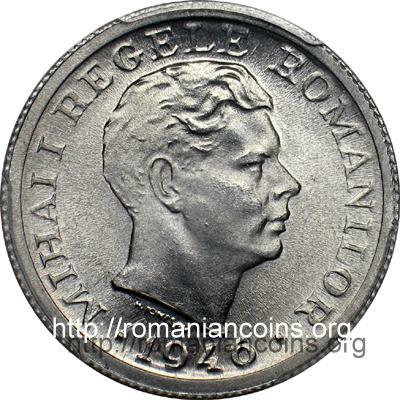 The coin pictures above are present on Romanian coins through the kind permission of an anonymous donor. The Decree no. 1814 from June 11th 1946, published in the Official Gazette no. 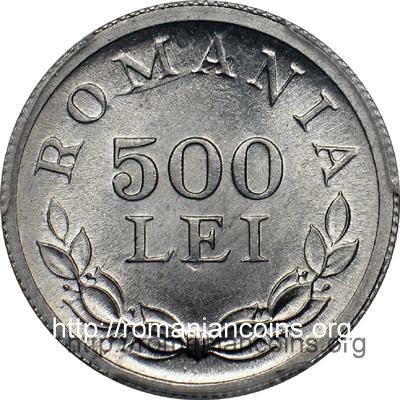 137 from June 17th 1946, settled the issuing of metallic coins of 500 and 1000 lei in aluminum and 2000 lei in brass (information from book "Monetele Romaniei" = Coins of Romania, by Octavian Iliescu and Paul Radovici, Bucharest, 2004, in Romanian, written in 1969 but not published at that time. 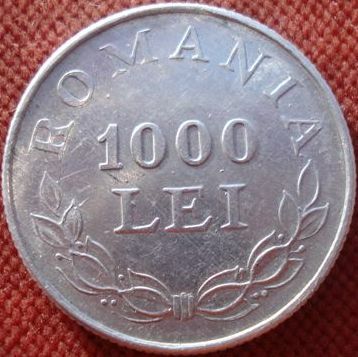 The aluminum 1000 lei coins were not issued. The piece can be considered to be a pattern or maybe an essay. 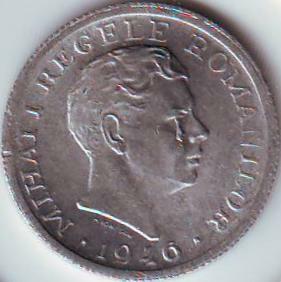 The pictures of the 1000 lei 1946 coin below are present on Romanian coins through the kind permission of Mr. P.K.. The pictures of the coin below are present on Romanian coins through the kind permission of Mr. Tudor Ciumara. The two zeroes from 500 are missing and the edge of the coin is flat instead of grained. The coin weight 1.5 grams and have 23.6 mm in diameter. It is possible that the coin is in this state as a result of a striking flaw. Another explanation, more plausible, is that the coin was ground in order to remove the edge teeth and the last two zeroes of the face value. The modification was made after the monetary stabilization from August 15th 1947. The 500 lei 1946 thus modified resembled the 5 lei 1947 coin and could have been used as a fictitious 5 lei coin. So, it can be considered a fake against the issuer. The picture at right - 500 lei 1946, with a teardrop like piece of metal below king's eye - appears on the site thanks to the kind permission of Mr Cristian Ciuplea.